Some of your favorite Greek flavors all go towards creating this delicious pasta meal. 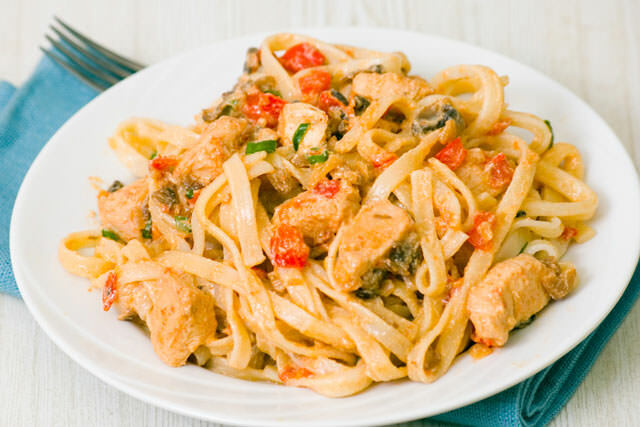 Our Greek chicken pasta is also a healthy dish you can eat without losing sleep. Cook pasta until tender but firm, usually between 8 and 10 minutes in boiling water. Heat your olive oil in a pan on medium heat. Add onion and crushed garlic and saute for about 2 minutes. Put the chicken in and cook for around 6 minutes, until it’s no longer pink in the middle. Reduce the heat and then add artichoke, feta, tomato, parsley, oregano, lemon juice and pasta. Stir and cook for about two to three minutes. Remove from heat and season with salt and pepper.